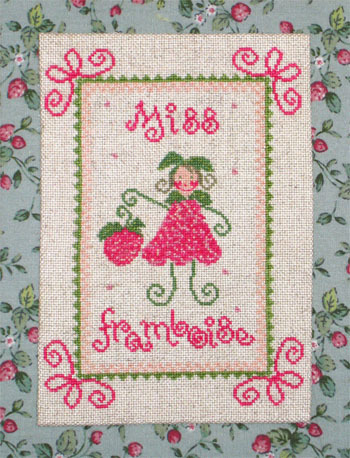 "Miss Raspberry" is a cross-stitch chart with instructions translated in English. It is part of a series (see the related products' section below). Special stitches:This is a pure cross-stitch design with very few back stitches (the mouth) and one French knot (the nose). The model on the picture has been stitched as a miniature on a Floba fabric (colour Flax) using one strand of cotton over one thread of fabric. But you can stitch it on the fabric of your choice using two strands of cotton over two threads of fabric (or one block of Aida).